Ultimate Fighting Championship (UFC) recently updated its “official” fighter rankings in the wake of last weekend’s UFC Fight Night 77 mixed martial arts (MMA) event, which took place on Saturday (Nov. 7, 2015) inside Ibirapuera Gymnasium in Sao Paulo, Brazil. For complete “Belfort vs. Henderson” results and play-by-play click here. As expected, former division No. 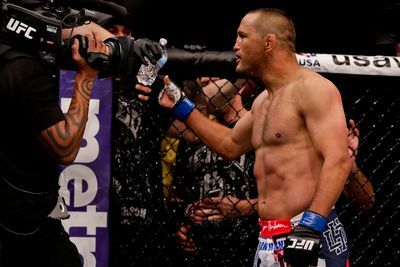 1 contender Dan Henderson dropped another spot in the standings after coming up short against Brazilian nemesis Vitor Belfort. Thomas Almeida and Corey Anderson, meanwhile, watched their stock rise at bantamweight and light heavyweight, respectively. Any hope Patrick Cummins had of becoming a major player at 205 pounds went out the window after he was knocked around by brutal brawler Glover Teixeira (watch it), who maintained his top-five spot after two rounds of bloody action. “Durkin” fell to No. 11. Here’s what the latest ranking field looks like courtesy of UFC.com. Note: (+/- = movement in rankings, *NR = Not previously ranked).